Railpictures.ca - colin arnot Photo: A Fallen flag in terms of the train. The American Orient Express is no more. 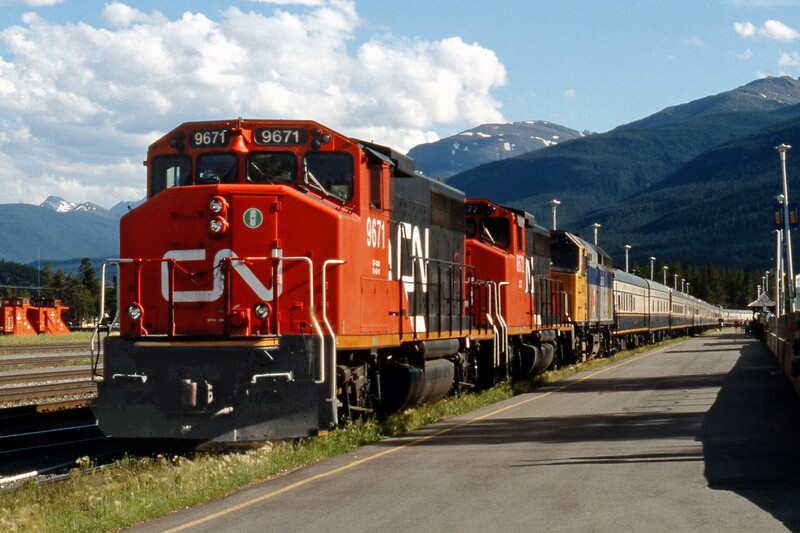 Seen here in Jasper in July 2002, some 6 years before its final demise. The GP40′s are still around and can be seen on CN duties, but not looking as clean and shined up these days. VIA 6438 is of course still active in the fleet although now in it’s -3 rebuild configuration. | Railpictures.ca – Canadian Railway Photography – photographie ferroviaire Canadienne. Caption: A Fallen flag in terms of the train. The American Orient Express is no more. Seen here in Jasper in July 2002, some 6 years before its final demise. The GP40's are still around and can be seen on CN duties, but not looking as clean and shined up these days. VIA 6438 is of course still active in the fleet although now in it's -3 rebuild configuration.